August, 1976. U.S. Naval Academy. 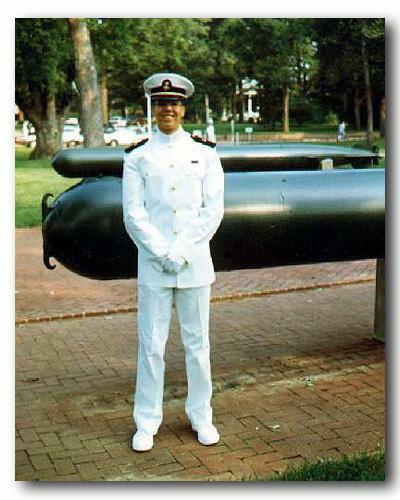 After Plebe Summer but before the academic year started. After losing 20 pounds. However, triumphant, since the firsties had failed in their attempts to kick me out. But it wasn't over yet. Plebe year promised tortures undreamed of as the Brigade returned, the second-classmen (juniors) coming back from cruise, the youngers (sophomores) back from their cruises with their new and untried status as upperclassmen, and firsties we'd never seen before. We'd cringed in terror of the Brigade coming back. "You'd better take a strain, you wimps!" the firsties would scream. "You think we're bad? Wait till the Brigade comes back! Then you'll know what misery is! We're the good guys! The second-classmen will roast your asses for lunch!" The Brigade came back with fanfare as we plebes were joined in ranks by the upperclass midshipmen we'd never seen. But we realized we'd been deceived. The youngsters were mellow, the second-classmen were burned out, and the firsties who had not trained plebes didn't for a reason - they didn't care. September brought the peace of upperclassmen who let us slide - except now academics bore down on us. We should have feared the professors. That first semester had only one highlight as my roommate, Robert Oxborrow (later to become an aviation test engineer), played a prank on our firsties at Halloween. On Halloween, the dreaded firsties would come around for candy. Oxborrow's squad leader, who had taken a solemn oath to haze Oxy out of the Academy, decided that Halloween was an occasion to bury the hatchet, and like the other firsties, he came by shouting, "trick or treat!" What he got from Oxy was a bag of peanut M&Ms surgically opened and emptied of half the candy with a dead mouse found on the deck inserted inside, then carefully glued back together. Oxy couldn't resist putting his signature on the gift, saying something like, "Enjoy the M&M's, sir." Within ten minutes the shriek echoed down the hall as the firstie (later accounts insisted) poured the contents of the bag into his face and had the rear legs and tail of the corpse sticking out of his mouth. If Oxy had it bad before, it was nothing to what he had to put up with until the very hour the Class of 77 finally graduated.